The Dignity Big Tent Night is a really fun way for the children (and grown-ups!) to connect with overseas mission. You can join in and make a difference in the lives of people like Margaret and Josephine. Watch this video to find out more. You can take part in the Big Tent Night on your own, with your friends or even with your church. Pick a date for your Big Tent Night. Invite some friends to join you or speak to your church about doing it all together in church. You can use this letter to share the idea with your church. Spend your “Big Tent Night” sleeping in your tent. Ask your friends and family to support people like Margaret and Josephine with you by making a donation to Dignity. You can use this donation sheet to help with this. Let us know you are taking part, tell us how you get on. Speak to Gill or Jo in our office on +44 (0) 161 434 8841 or email us at events@dignityonline.org.ug. You could even send us a photo if you are happy to share one with us. Return the donation sheet and the donations (Dignity, 6 Barlow Moor Road, Didsbury, Manchester, M20 6TR). If you or the kids in your church or school are interested in joining in we’ve made it super easy. 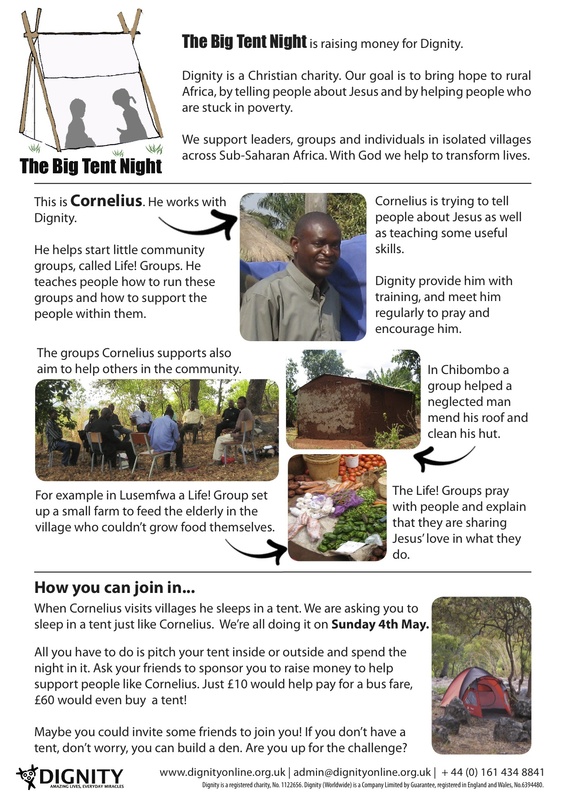 You can download The Big Tent Night information sheet and sponsorship form below so you can get started. If you let us know you are joining in we would be happy to visit your church or school to help get everyone excited about The Big Tent Night! We can also send you some stickers to put on collection pots and hard copies of the information sheet and sponsorship form if you want them. Just get in touch on 0161 434 8841 or admin@dignityonline.org.uk. We can’t wait!! 4 resources to help make it super easy for you. A letter to help you share the idea with your church. Margaret and Josephine’s story to help you tell people about what you are doing. A donation sheet to help you keep track of donations people make. Ideas for group games if you are taking part as a group.